In May 2018, Ronnie and I took a 16-day trip around northern Europe. We had several focuses: art, trains, and chocolate!!! 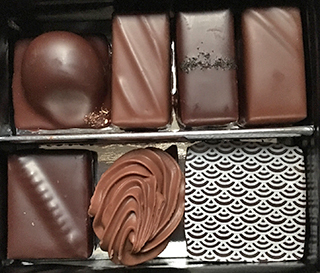 The last post was about our chocolate pilgrimage to Brussels. This time we spend a lot of quality time in Paris. 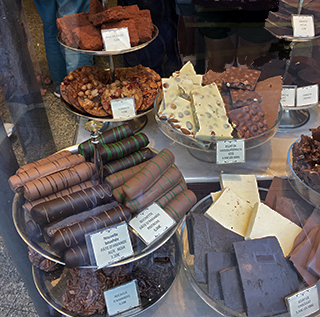 Before we started this blog in 2009, Ronnie & I visited Paris and were wowed by all the chocolatiers in the city. Since it was our first trip to Paris, we spent most of our time visiting museums and tourist attractions, and didn’t really experience Paris chocolate. This time, we revisited some museums and checked out Paris destinations further afield, but also window-shopped a lot of chocolatiers and visited a few. We spent the first day of our Europe trip in the north side of Paris, exploring less-touristy places like Canal St. Martin with its locks and iron bridges, and Parc des Buttes-Charmont, formerly a quarry, now a pretty lake overlooked by a “temple” perched on cliffs created by the quarry excavations and crossed by pedestrian bridges. We didn’t find any chocolate on this walk, but in the evening after climbing Montmartre to see the view, we stopped in at Maison Georges Larnicol at the base of the hill. It’s a rather touristy scene with lots of souvenir and gifty chocolate selections, but the real attraction is their chocolate sculptures. There are numerous sculptures throughout the store, and they are big and detailed. Some are Paris attractions like the Eiffel Tower (over 6′ tall), Arc de Triomphe, and Notre Dame. Others are more unexpected like a tiki totem pole and old-fashioned sailing ship. They are well-made and incredibly detailed. Of course, they are not for sale, but there were some very small molded/sculpted pieces, bugs, fish, birds, etc., that were for sale amid the bins and bins and bins(!) of chocolates, caramels, macarons, cookies, and pastries (whew!). The place is overwhelming. We didn’t find the chocolate compelling enough to buy, but I recommend visiting if you are in the vicinity to see their artistry in chocolate. And if you try the chocolate, let us know how it was! After that first day wandering Paris, we hopped on the overnight train to Hamburg, then visited Berlin, Amsterdam, and Brussels, before taking the high-speed train back to Paris, where we stayed on the south side of the city for a few days. On the recommendation of a fellow chocolate lover, we visited Maison Le Roux in the 6th near the chic Boulevard Saint-Germain on our first day back in Paris. The shop is stylish but cute with an interior design featuring lots of raised chocolate-colored squares mimicking a chocolate bar — with the occasional red square tossed in for contrast. 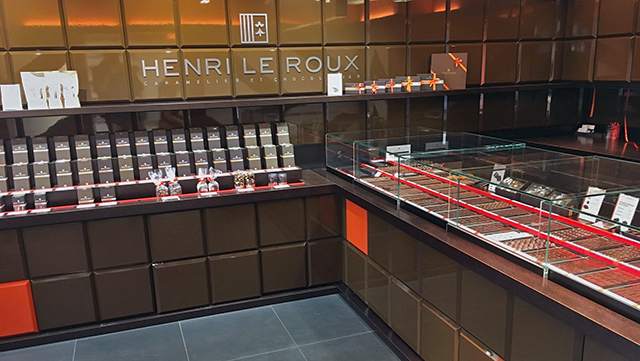 The founder, Henri Le Roux, started the business in 1977; and it has been very successful, winning lots of prestigious awards. They have a wide variety of chocolates and caramels for sale: 40–50 varieties of pralines, truffles, and enrobed chocolates; and about half that number of caramels. They also sell bars, mendiants, marshmallows, paves, spreads… You could spend hours trying to decide what to buy. We got only a small box to try, and it was agony trying to pick only 6 flavors. We knew we had to get the Szechwan Pepper, based on our friend’s recommendation. 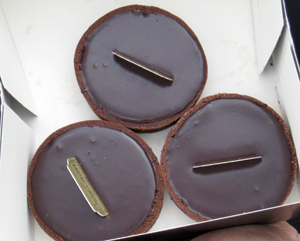 It was a slightly peppery ganache layer on a thin slab of nice crunchy nougatine covered in dark chocolate. Very nicely balanced. We relied on the staff to help us fill the rest of our box. She strongly encouraged us to try the CBS, short for Caramel au Beurre Salé. 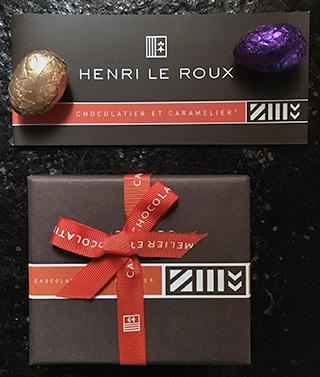 Henri Le Roux created the Salted Butter Caramel when he started the business, which is so important to the business that they registered the trade name back in 1981 and their name includes Caramelier. It is a very nice caramel: Classic buttery taste with the salt not noticeable in itself, but supporting the butter and caramelized sugar. It’s a slightly flattened square, chewy caramel but not real chewy. It won’t stick in your teeth. The perfect chewy texture is due in part to the “secret ingredient”: crushed almonds and hazelnuts. We got a couple of chocolate pieces that were too sweet for us. The Othello looked like a swirl of icing. It was cute but the milk chocolate hazelnut paste surrounding a whole caramelized almond was too sweet, like icing. I’d eat the caramelized almond on its own though. The chocolate version of the CBS also didn’t work for us. The caramel ganache was just too sweet, with nothing to distract from the sweetness. Stick to the original caramel. Our final 2 selections had split results. The Lemon Thyme was interesting and tasty. The ganache had little pieces of thyme in it, which I’d not experienced in a chocolate before. It was not as sweet as the others, and I liked the herby flavor. The Prune on the other hand was disappointing. It tasted almost like tobacco. Henri Le Roux, 1 Rue de Bourbon le Château, 6th Arrondissement and other locations. I think Chocolat Foucher’s window display could make the French phrase for window shopping reality. Lèche-vitrine translates as “lick the shop windows,” and Foucher’s windows included pavés as big as my fist. 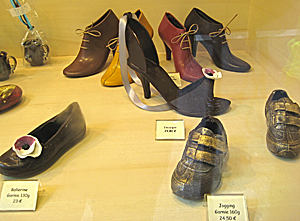 Everything in the window was super-sized from the pavés to the rochers and the other pralines. I stopped and gawked each time we walked by, but managed to suppress any urge to lick the windows. Pavés are squares of ganache dusted with cocoa powder. Because they have no preservatives and are super rich, they are sold in small, bite-sized squares. I didn’t buy any Roi-sized pavés, because I was more interested in variety than volume, though if I was having a party, I think they would be a fun centerpiece dessert. Instead, we bought a variety of single-origin and inclusion bars. 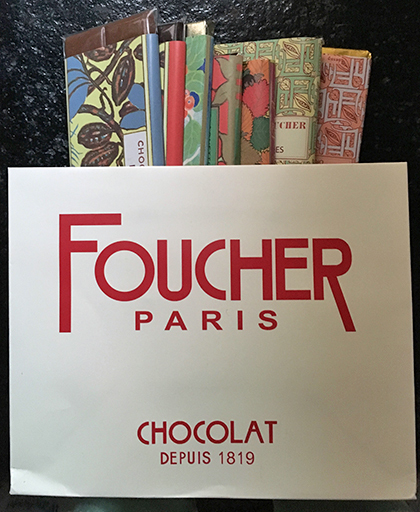 The single-origin bars were especially attractive in wrappers decorated with patterns from Foucher’s 1930s advertising. All of the bars were well made, shiny, with a good snap and a smooth mouthfeel. A couple of the more unusual single-origin bars were a dark chocolate made from Cuban beans and a milk chocolate made from beans from Papua New Guinea. Cuba was a new bean-originator to me on this trip, so whenever I saw Cuban single-origin bars, I had to get one. The Foucher Cuban bar took a while to melt, but had a good deep taste that was earthy and not bitter. It’s a dark chocolate, but I have no idea the percentage — it’s not written on the label, and I didn’t think to ask. I guess because these bars were not made for export, they don’t have to include any ingredient information. The Papua New Guinea bar was unusual. First, because it’s a milk chocolate single-origin bar — I haven’t seen that before. And second, because the milk taste was weird — like condensed milk. It was sweet and unexpectedly cooked/reduced tasting. Overall, the chocolate taste was strongly raisin, but with a condensed milk top note — like a Vietnamese coffee. Again with no info on the wrapper, the ingredients will be a mystery until I can visit the shop again with my new list of questions. The 2 inclusion bars held their own surprises. The dark chocolate with almonds contained finely chopped almonds instead of whole almonds or big pieces, which is what I expected. I find chewing almonds in chocolate very satisfying, but this was nice too. I could let the chocolate melt in my mouth more, which resulted in more of a lingering chocolate aftertaste. The orange chocolate bar had a better surprise: It was flavored with clove. It had a Christmas spice feeling, in that it was more clove than orange, and reminded me of Constant Comment tea. The clove flavor also lingers longer with the chocolate aftertaste than the orange. If my French were better, I wouldn’t have been surprised: While there was no ingredient listing on the wrapper, it did say “Orange Girofle” right on the front. Girofle is French for clove. Since Chocolat Foucher has been around since 1819, they have a depth of experience in making chocolate, so I can recommend trying anything in the store. Their packaging also displays their history — almost every box or wrapper is decorated with vintage illustrations from their earlier advertising, shop decorations, and original packaging. They make for very nice souvenirs or gifts. 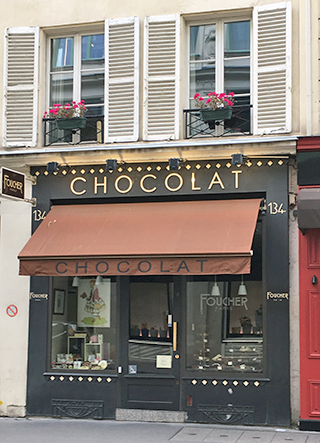 Chocolat Foucher, 134 Rue de Bac, 7th Arrondissement and other locations. Date posted: November 17, 2018. This entry was posted in Chocolate around the World, European chocolate, Featured, Front page, Outside the Bay Area, Paris chocolate and tagged almond, caramel, chocolate sculpture, clove, Cuba, Foucher, hazelnut, Henri Le Roux, lemon, orange, Papua New Guinea, Paris, pavé, prune, salted caramel, Szechwan pepper, thyme. Bookmark the permalink.